Retiring from Active Duty is - by any objective standard - a major transition with many moving parts. Moreover, these said moving parts combine all the elements of a firestorm: finances, emotions, perhaps moving, and lifestyle change. Though daunting, military retirement is definitely manageable. I will provide a few pointers that may be of assistance to you. The things you think will be difficult with retirement will be easy and the things you think will be easy will be difficult. While I cannot guarantee anything, I am very confident in that statement. For example, cleaning out your desk is typically a rudimentary task for a PCS....doing it for the the last time in uniform will rock you a bit - or it should. There are other retirement nuances not typically covered in Transition Class. For example, for Senior Officers, you will likely graduate down a bit right after the retirement ceremony. Meaning, fewer people will call you "Sir" and you will almost undoubtedly be treated differently when you take off the uniform for the last time. Not a humongous deal, though a change nonetheless. While transitions can be difficult, I think those retiring from active duty have a White Hot Future with so very much in their favor. I will talk more about that in a bit. For now, I simply suggest embracing the change and embark on your "2.0 Plan" with vigor! Medical Benefits: Tricare - either Prime or Select. Both are awesome plans in my opinion. Don't get to twisted up in trying to choose between the two: if one were significantly better than the other, there would only be one option. It comes down to a matter of choice between having to see your Primary Care Provider or not and the annual premium, which is mercifully inexpensive. Financially speaking, the maximum out-of-pocket remains the same - $3,000...this is a great deal. One note for the prospective self-employed: Tricare Prime may make sense for you as you can deduct the medical premiums as a business expense. Pension: Not much to say here...it is pretty much as advertised - a deposit shows up in your Direct Deposit account every month. The primary difference here is you are paid only once per month at the end of the month instead of twice per month as when on Active Duty. Commissary and Exchange Privileges: Don't discount the value here...the groceries are priced at just above cost and the sales tax savings are real....very real. Military Preference Hiring: This is a very big deal. Depending on a variety of factors regarding your status (Veteran, Disability, etc. ), you may be entitled to preferential hiring for Government Civilian jobs. If you want to pursue that professional path, this is an invaluable benefit. Of note, there is a 6-month waiting period after leaving Active Duty, so factor that into your decision matrix when contemplating the next step. Obviously, there are a plethora of other benefits, though I won't describe them here. A good first step in any endeavor is to get (and stay) organized. You will want to hold onto many documents from your military service - including (amongst many) your DD-214. Some you will want to keep in paper (original) form, others you can transfer to the electronic medium. Let your scanner be your friend here and get yourself on-line for document storage where you can. The Book - a basic game plan for gathering your important documents. Using a Password Manager - managing your digital footprint is more important than ever. This is one of the bigger decisions you will face, period. If you are single and have no dependents, you can side-step this one. Otherwise, you have some thinking to do. All things considered, SBP is a pretty good deal. True, there are circumstances that could unfold that can make any decision seem foolish. For example, if you pass away on Day #1 of retirement after not electing into SBP. Or conversely, you do opt-in to SBP and you outlive your spouse. Bottom Line: SBP is an insurance program and it is intended to mitigate risk. We frequently buy insurance we don't use - think auto or umbrella insurance in any given year. Therefore, in my view, I recommend against over-thinking the SBP decision and not thinking of it as a zero sum game where you have to get more out of it than you put into it. Rather, think of what you are trying to achieve and utilize the program if it makes sense for you. For a more detailed discussion on SBP, please read this article. This is another area where the transition class coverage can vary dramatically. Simply put, VA Disability is a huge deal financially as it is tax-free income for the remainder of your life. Would anyone care to argue what a big deal VA Disability is? Bottom Line: I strongly recommend seeking the advice of recent retirees and enlisting the services of a Veteran Service Organization (VSO) for filing your initial claim. For a more detailed discussion on VA Disability, please read this article. TSP Basics: This is a good primer explaining the nuances of the TSP. TSP Considerations When Leaving Military Service: A few thoughts for what to do with your TSP Account. 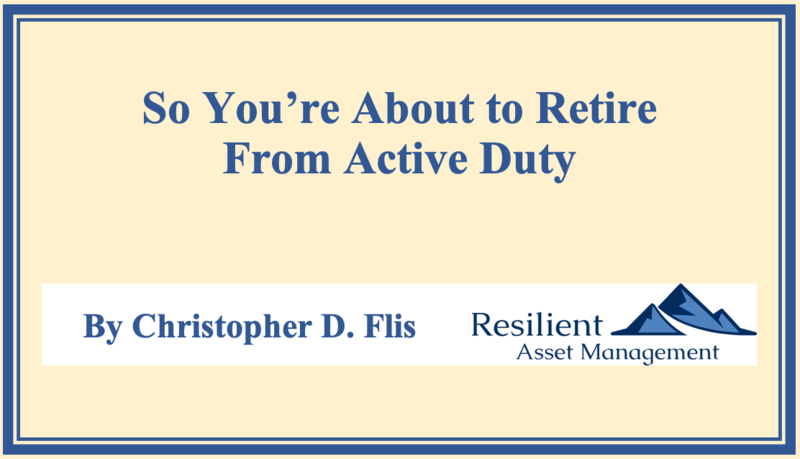 You have some options available to you upon retirement that you do not have on Active Duty. TSP Rollovers & When They Might Make Sense: This article takes a deeper dive into TSP Rollovers and when it might make sense for you. Estate Attorney: Attorneys are expensive, no doubt about it. Estate Planning is one area where errors in planning can have dramatic (and expensive) cascading effects. As far as Attorney Fees go, Estate Planning, for most, ought to be affordable as the requirements are usually very well-defined and there is typically no opposing party. Thus, it is not difficult to find an Attorney who will work on a fixed-fee basis. Accountant: Most people have prepared their own taxes at some point, which is great. As you age, generally you acquire more assets, have multiple retirement accounts, and a generally more complicated tax situation. This is when an accountant can be an invaluable resource. Moreover, fees are generally acceptable and the time savings can be significant. Referrals are a good place to start followed by interviews with prospective candidates. Having a great relationship with an accountant can be very financially rewarding. Real Estate Agent: If you are going to sell your home upon retirement, offloading the responsibility to a trusted professional to sell your home will take a huge time burden off your plate. Retirement is stressful, so don't over do it trying to be a FSBO. Transition Specialist: There are an enormous number of organizations out there specializing in all the different aspects of military transition. True, most center around employment, though there are many others. If there is one area of transition causing you angst, there is likely an organization out there supporting it. Financial Planner: Obviously, I am a Financial Planner - no hiding there. That said, in my experience, military members in transition usually do not regret the choice of working with a financial planner. If you associate with the right type of planner, he/she can walk down the path with you, hopefully assisting you with side-stepping the pot holes lying in wait for the unprepared. I am partial to fiduciaries who put your interests in front of his/her own at every turn. There are numerous financial planners specializing in serving military members - research, interview, vet, re-research, get referrals from trusted friends - it is likely to be a financially beneficial experience for you. Have a Retirement Ceremony. Serving your country for 20+ years is a remarkable accomplishment. A full-on retirement ceremony is among your deserved benefits. Not only does it provide you a ceremonial endpoint for your career, it also allows others to properly recognize all you have done. And finally, it is a great example for the younger Soldiers, Sailors, Airmen, and Marines. I strongly encourage all prospective retirees to have a retirement ceremony. Take Some Time Off. Nearly all retirees are used to the twice per month rhythmic paychecks and the structure a military career provides. Upsetting that apple cart is unsettling, which leads many new retirees to jump into another job straight away. In some cases, this is advisable. However, in my experience, I have found that those who jump right into the "2.0 Plan" frequently regret it. So, if able, take some time off to degauss, recharge, and allow yourself a time to ooze into the next phase of your life instead of bull-rushing in. Don't Underestimate the Day After. Leaving active duty is an emotional thing. Ironically, for me anyway, there was very little build-up to it. Rather, it all hit me at the podium when the retirement ceremony started. For as emotional as the ceremony was and for as fun as the parties were for the rest of the day, the day after was quite a let down emotionally. Beyond my wildest beliefs, the Navy went on without me...how could that be? Well, that is a question we all confront the morning after. I have no prescription for this, though I do suggest considering this and planning a few recreational activities to segue into civilian life. That's it - a few thoughts from the cheap seats. Obviously, this article is not a panacea for all things retirement. Rather, I wanted to point out a few areas I thought applied to all prospective retirees in general. Like I said, it is a unique journey - though an enjoyable one - so do make the most of the celebration that is a career of dedication and service to your country. If you have any questions or suggestions for enhancements to this article, by all means, please reach out to me directly at chris@resilientam.com.